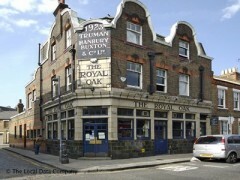 About: The Royal Oak is a popular gastropub which serves cocktails. On Sundays it is very busy due to the market on Columbia Road. Children are welcome and no-smoking tables are available upstairs. There is also a small courtyard. The Royal Oak on Columbia Road became 'Samoan Jo’s' in Guy Richie's Lock, Stock and Two Smoking Barrels. Columbia Road Flower Market is without a doubt one of London’s finest days out, however, it is also one of London’s most stressful. The crowds, the yelling, that overpowering scent of nature, yuck! Get thee to the Royal Oak for a slap up roast dinner of admirable quality. "This is the outpost for all that’s art, craft and general show and tell about East London"
Located on Columbia Road, the Royal Oak is an attractive plot that blends in well with the street’s many creative outlets. This is the outpost for all that’s art, craft and general show and tell about East London - and that’s before a mention of Sunday’s Flower Market. It’s a quiet place early in the week but that’s arguably the best time to make the most of what is a genuinely attractive London pub, all wooden beams and vintage fittings. The large circular bar is a spectacle and from it a hip, yet friendly staff serve efficiently. Towards the weekend the mostly young crowd grows ever more lively and by Sunday’s Flower Market things will often have developed into an all day marathon – which is always fun if you’re into it. The food is served both in the bar and the quiet dining space above it and the prices should mean quality. The excellence of the brunch can be vouched for with a generous portion of bacon, eggs (however you want them) and mushrooms dished up on some mean looking hunks of bread. Sunday lunch is also popular, and once again it’s served to a good standard. The charcuterie boards are also worth a taste. The bar serves a couple of average lagers – Amstel and Kronenbourg – and prices are high as you’re paying for the area. There’s a good range of wine, but once again prices are hiked up. The Royal Oak is one of this area’s less pretentious fashion-pubs while at the same time attracting a higher percentage of outlandish looking characters than most venues. Which all makes for a nice bit of variety. Nice in summer but Absolutely awesome in winter! Love the sharing boards, mulled wine/cider and general happy vibes in here at this time of the year. Nowhere do I feel as festive and cosy as at The Royal Oak in December. OKay, maybe at the Cross Keys on Endell Street, but that's it.